Although this number may vary, due to the interpretation of the objectives of the satellites by those who own them, this figure is a good indicator of the plethora of military assets that have been deployed in space over the stated time period. The satellites can be roughly grouped as communications, navigational, reconnaissance, early warning and intelligence gathering spacecraft. Clearly, these programs are clouded in secrecy. The USSR/Russia assigned the name Kosmos to many of their military satellites (although not all Kosmos satellites are of a military nature), while the USA introduced the USA series identification in 1984 to cover a wide range of military satellites. How Do We Know What’s What? 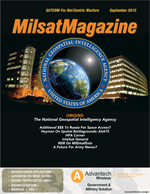 If the data is not revealed at the launch through press releases (such is the case for the Navstar satellites which, in spite of their civilian use, are in the first instance for military purposes), the objective can often be deducted from the type of launch vehicle, the launch site, incidental pieces of information, as well as amateur observations. Together, these military satellites are significant tools for the conduct of warfare, be such on a local or a global basis. However, they also serve as a means of the superpowers to keep tabs on each other, thereby [hopefully] avoiding accidental, global warfare. The outcome of any military conflict can be influenced by the ability to deny the opponent access to space-based resources. The interesting element here is that if the destruction of an opponent’s space assets is not done in a ‘smart’ way, a snowball effect may result, wherein the debris resulting from the first satellite’s destruction could randomly destroy other satellites—including ‘friendly’ ones—which, in turn, create more debris that destroys even more satellites, and so on and so on. Known as the Kessler Syndrome, so-named after NASA scientist Donald J. Kessler, such actions could render space exploration, and even the use of satellites, unfeasible for many generations to come. Table: 1 launches in Program 437. Due to the secrecy surrounding this topic, information is extremely limited. Certainly more advantageous means that are mentioned in this article are being researched, even in operation to silence, or even destroy, satellites—however, such crucial information remains shrouded in secrecy. There could well be methods currently under investigation that would result in the silencing of opponent satellites through cyber warfare, which would negate the occurrence of debilitating debris. Both the USA and the USSR were considering ground launched missiles in the 1950s as a means of destroying orbiting satellites. Both countries were concerned about the deployment of nuclear weapons from an Earth orbit. In the USA, an extension to the Weapon System WS-199A project of 1958/59 was considered, in which a Bold Orion, air-launched, ballistic missile (ALBM) was to be fitted with an Altair upper stage to create an anti-satellite missile with a range of 1700 km. (1,100 miles). One test flight of this combination was made on October 13, 1959, in a simulated attack on the Explorer-6 satellite, which was at an altitude of 251 km. (156 miles). To allow control of the missile, telemetry was transmitted to the ground and flares were ejected to aid in the visual tracking of the missiles, as well as tracking by radar. The missile passed within 6.4 km. (4 miles) of the satellite. In another test on September 22, 1959, a Lockheed High Virgo missile that had been adapted for an anti-satellite role attempted to intercept the Explorer-5 satellite. Communications were lost after the Virgo was launched and no determination could be made regarding any success of this test. The U.S.A.F. also conducted anti-satellite tests with the Thor missile, wherein a nuclear warhead was to be exploded in space to disable a satellite. Known as Program 437, 16 launches from Johnstone Island took place between February 14, 1964, and November 6, 1975. Hi-Hoe. Photo is courtesy of the US Navy. The US Navy engaged in their own testing during the early 1960s with the SIP and Hi-Hoe test programs. The missile used for these tests was a Caleb missile, developed at the Naval Ordnance Test Station (NOTS) as a fast response expendable orbital launch system to place small reconnaissance satellites and other military payloads into orbit on short notice. Test were conducted as part of Project Pilot, where the launch vehicle was deployed from an F4D Skyray aircraft. The project was canceled in 1960; however, two leftover and modified Calebs were used in the Satellite Interceptor Project (SIP). 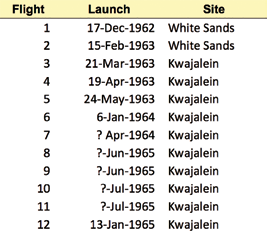 These launches were conducted on October 1, 1961 and May 5, 1962, from a launch pad on San Nicolas Island, with the missiles reaching an altitude of 20 km. 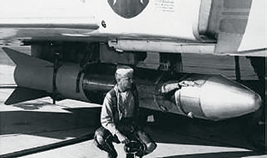 The associated Hi-Hoe program saw an additional three, leftover Caleb missiles fired from a McDonnell F4H Phantom II aircraft on May 10, 1961, March 26, 1962 and July 25, 1962—the final launch was successful in reaching an altitude of 1166 km. (724.52 miles). Further development by the US Navy was canceled following pressure to halt the program by the US Air Force. The US Army, separately from the US Air Force and the US Navy, explored the possibility of converting their Nike Zeus anti-ballistic missile system into an anti-satellite system as part of Project Mudflap, or project 505. Work on this commenced around 1960 and resulted in the DM-15S version of the missile. The changes involved a two-stage hydraulic pump and a higher performance booster propellant. Table 2. Nike Zeus DM-15B + S launches. Similar to the US Air Force’s Thor missiles, the Nike Zeus DM-15S was to use a high altitude nuclear explosion to knock satellites out of commission via the damaging effects that would be caused by the explosion’s electromagnetic pulse on electronic equipment. Following a test flight of an experimental DM-15B on December 17, 1962, from White Sands in New Mexico, the first launch of a DM-15S occurred on February 15, 1963, and reached an altitude of 280 km. (173.98 miles). This launch was followed by the interception of a simulated satellite on March 21, 1963, at an altitude of 207 km. (128.62 miles). The first attempt at an actual interception took place on May 24, 1963, against an Agena D target. The system was considered successful, resulting in the Nike Zeus DM-15S, as well as five nuclear warheads, becoming secured at their launch site on Kwajalein Island. In May of 1966, the program was declared redundant and closed. 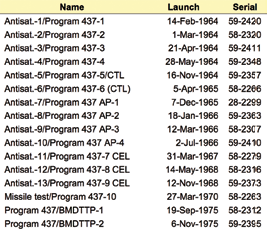 (See Table 2: Nike Zeus DM-15B and S launches) One of the factors leading toward this termination was that the nuclear explosion would also have impacted upon other US satellites on orbit. By 1982 most work on ASAT was undertaken as a low priority—that is, until Russia resumed their anti-satellite tests as described below. This undertaking generated a brief revival that resulted in the Vought ASM-135 ASAT missile, which, on September 13, 1985, was launched from an F-15 Eagle fighter at an altitude of 11,613 meters (7.22 miles) and successfully intercepted a Solwind P78-1 satellite that was flying at an altitude of 555 km. This resulted in 284 pieces of trackable debris. The plan was to have more than one hundred F-15s become part of this program. Further development was abandoned in 1988 due to problems with the Miniature Homing Vehicle (MHV) interceptor’s home guidance system. The US Navy successfully destroyed the USA-193 military satellite on February 29, 2008, using a RIM-161 Standard Missile 3 ABM missile. The reason for this mission was that USA-193, launched on December 14, 2006, had failed to function and the satellite’s orbit was rapidly deteriorating into lower orbits. Additionally, the satellite carried approximately 450 kg. of toxic hydrazine fuel which could pose health risks to persons within the immediate vicinity of the crash site, should any significant of the fuel survive re-entry. This problem provided a solid opportunity to test the ABM’s ASAT capability. The satellite’s resultant destruction caused the satellite’s breakup into 174 pieces of trackable debris. During the 1990s, a Kinetic Energy ASAT (KE ASAT) system was proposed wherein a ground based interceptor would destroy satellites by homing in and deploying a mylar plastic sheet. The plastic sheet was meant to strike the target without a shattering effect. The KE ASAT system was, however, restricted to satellites in Low Earth Orbit (LEO). The plan by the US Army was to conduct seven test flights, starting in 1996, with two of these flights to undertake interceptions of inactive US satellites, whereas the other five test flights were to conduct close passes of on orbit satellites. The Clinton administration canceled the program. Little is known about USSR attempts to destroy satellites through the use of missiles, except that during the 1960s, the USSR tested the use of their nuclear Galosh missiles as satellite interceptors, while tests were also conducted with the Gorgon missiles. Also in the early 1980s, the USSR began developing a counterpart to the US air-launched ASAT system, using modified MiG-31 ‘Foxhounds’. The belief is that at least six such aircraft were converted for this purpose. The USA and the USSR/Russia have considered energy weapons, including a nuclear-explosion powered X-ray laser, as potential anti-satellite weapons. One of the features of the laser beam is that as the beam passes through the atmosphere, scattering occurs and power is lost. 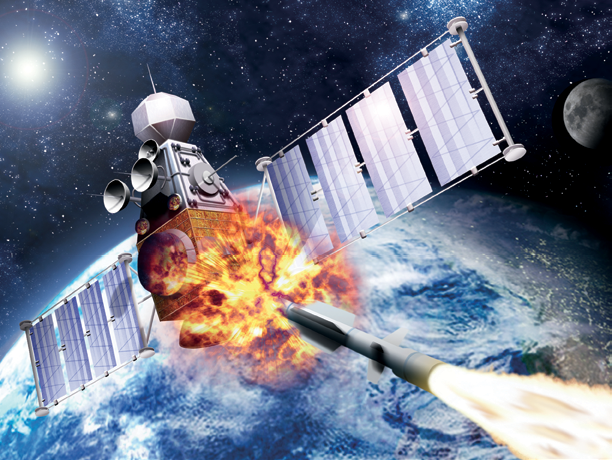 The destruction of a satellite via laser beams is, therefore, simply not possible; however, a laser beam can interrupt a satellite’s operation, which then denies the enemy use of that satellite. This is, in certain situations, an advantage, as debris is not generated to threaten other spacecraft. In 1985, the US Congress banned the development of anti-satellite weapons for a period of ten years. When that period of time expired, the US Army then tested the Mid-Infrared Advanced Chemical Laser (MIRACL) on October 21, 1997, which was aimed at the MSTI-3 US military satellite at an altitude of 432 km. While the satellite was not destroyed—the vulnerability of the satellite’s sensors was certainly tested. Artistic rendition of an airborne laser in action. The laser beam technology was also expressed in the US Air Force’s YAL-1A Airborne Laser (ABL) project that involved a large, chemically powered laser inside a converted Boeing 747 aircraft. Intended primarily to destroy incoming missiles while they were still over enemy territory, one of the other potential uses of this technology was the targeting of satellites. One aircraft was built and flew in 2002, but the program was abandoned in December of 2011. In a similar way, the USSR experimented with large, ground-based ASAT lasers from the 1970s onwards. A number of US satellites were temporarily ‘blinded’ during the 1970s and 1980s. The USSR had also researched Directed Energy weapons as part of that nation’s Fon project. Anti-satellite satellites have always been, and to this day remain, an integral part of the USSR/Russian space warfare plan. In 1962, Sergei Korolev’s OKB-1 bureau proposed the crewed Soyuz P (for Perekhvatchik, which means interceptor), also known as 7K-PPK (Pilotiruemyy Perekhvatchik Korabl, which means manned interceptor spacecraft). This was intended to be a version of the Soyuz spacecraft for the piloted inspection, and destruction of, enemy spacecraft. After a rendezvous with an enemy spacecraft, a cosmonaut would engage in extra vehicular activity (EVA) and, depending on the outcome of the inspection, the spacecraft would then be destroyed, neutralized or returned to Earth for further inspection. Development was canceled in early 1965. 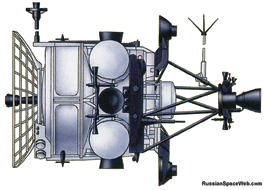 The USSR also considered Almaz military space stations, arming them with fixed Rikhter R-23 auto-cannons. The idea of an automatic satellite destroyer named Istrebitel Sputnikov (IS) in Russian was first conceived by designer Vladimir Chelomei in 1959. Basically, this was to be a semi-guided spacecraft that carried explosives. The IS was to be able to maneuver in space, including inclination maneuvers, a task that requires significant thrust. Work along the same lines was also undertaken by Sergei Korolev’s OKB-1 bureau. Maneuvering spacecraft had first been tested by the USSR with the Polyot-1 and -2, which were launched respectively on November 1, 1963, and April 12, 1964. Leading on from this was the flight of Kosmos-185, also known as I2-BM. The satellite was based on the Polyot design but was modified as an anti-satellite satellite prototype and was launched on October 27, 1967, for engine maneuverability testing. Starting in 1968, the USSR undertook a first series of anti-satellite tests that consisted of placing a target vehicle in orbit and then having this target overtaken by an interceptor which could destroy the target by exploding itself and/or possibly releasing a cloud of metal pellets in the target’s orbit. No weapons of any type were carried on these tests, which lasted until 1972, and had a success rate of 70 percent. The tests were suspended when the USA and the USSR signed an anti-missile defense treaty in 1972. Nevertheless, the USSR declared the original IS system operational in the following year. A second series of tests commenced in 1976 which possibly included a new guidance system that was not susceptible to jamming. The success rate of this series, which lasted until 1978, was only 57 percent. This series of tests were in a response to a USSR perception that the USA’s Space Shuttle could be modified as a space-based weapons carrier. As such, the nature of the test concentrated on the destruction of the target within the first orbit. Further developments did, however, continue and in May of 1987, the USSR leader Mikhail Gorbachev was shown the prototype of an anti-satellite and anti-missile platform named Naryad (Guard). This system was to be launched by a UR-100N missile but, as far as is known, no flights were accomplished with this platform. Suggestions have been made that the Rockot/Briz K launch of December 26, 1994 carried, separate from the Radio-15 payload, a Naryad payload that was to be exploded once released. At about the same time, on May 15, 1987, the first Energia rocket was launched. This rocket carried the Skif DM (Polyus) spacecraft, described as a prototype of a space-based battle station that could also accommodate anti-satellite weapons. The spacecraft failed to achieve orbit. Also during the 1990s, the USSR anti-satellite system was operational as the IS-MU system and was capable of intercepting a target during first orbit. No satellites were launched in this series. From 1998, the USSR also considered the destruction of satellites in geostationary orbit under the designation IS-MD. There is current evidence that Russia continues to consider a variety of anti-satellite capabilities. This evidence includes the possibility of satellite maneuvering tests that have been occurring over the past few years. 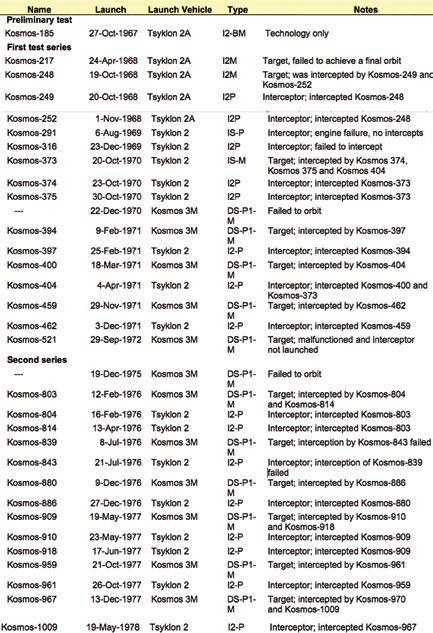 For instance, the Kosmos-2504 satellite that was launched on March 31, 2015, has made at least 11 close approaches to the upper stage that was placed into orbit. At least on one of these occasions, the upper stage was nudged into a higher orbit by the satellite. The spacecraft also approached, on one occasion, an unidentified piece of orbital debris. Another belief is that the USA also considered the use of anti-satellite satellites during the early 1980s. As part of the Brilliant Pebbles system, itself a component of the Strategic Defense Initiative, a satellite constellation of 4,600 kinetic interceptors (KE ASAT) was considered. These 45 kg. satellites would have been placed in LEO. At a later stage, these were thought to have been developed into a larger system of laser and charged particle beam weapons. As far as is known, no hardware was ever developed. Table 3. USSR ASAT satellites. Chinese development of kinetic and direct energy anti-satellite systems is believed to be occurring. On July 11, 2007, China successfully destroyed the Feng Yun 1-3 weather satellite with an SC-19 ASAT missile, resulting in 3,393 pieces of trackable debris. Feng Yun 1-3 was, at that time, in a polar orbit of 865 miles and the missile was launched from a mobile Transporter-Erector-Launcher (TEL) vehicle at the Xichang Space Center in northern China. In May of 2013, the appearance was that China was conducting tests of a ground-based ASAT system, with new approach and maneuvering tests underway. There are also suggestions that other countries, in particular, India, are developing weapons that could destroy satellites. Peaceful Uses of Outer Space? All these military tests, ultimately aimed at denying ‘an enemy’ access to a nation’s space hardware, occur against a background in which the United Nations, through the Committee on the Peaceful Uses of Outer Space (COPUOS), advocates the use of space for the benefit of all humanity: for peace, security and development. Jos Heyman is the Managing Director of Tiros Space Information, a Western Australian consultancy specializing in the dissemination of information on the scientific exploration and commercial application of space for use by educational as well as commercial organizations. An accountant by profession, Jos is the editor of the TSI News Bulletin (tiros.zarya.info/) and is also a regular contributor to the British Interplanetary Society’s Spaceflight journal.